I’d love to say to you, both the Rep Fitness power racks have Westside spacing, heavy 11 gauge steel frames with 3″ x 3″ tubing and if I could say that we would be talking commercial grade, and looking at spending 2 or 3 times as much. The PR1000 and PR1100 are two budget-friendly home gym racks from Reps 1000 range both are high quality, well built, durable and come with a lot for the price tag. 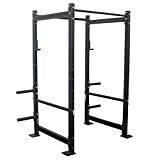 When we buy a rack for our home gyms, what we normally look for is stability, safety, versatility, and weight capacity, you get all of this and a lot more from both of these racks which is why they are both worth taking a closer look at. As we touched on earlier at this price you will not encounter the heavy gauge steel frames, I haven’t seen a power rack yet that costs under $300 with an 11 gauge steel frame, so there were no surprises here to see 14 gauge steel being used for the PR 1100 frame. lighter frame gauges do not necessarily mean you will get lower weight capacities, the Rep Fitness PR 1100 power rack comes with a whopping 1000lb capacity limit and there’s not many of us who are ever going to lift that heavy in our lifetimes. So no risk of outgrowing this thing. Because of the lighter gauged frame, the weight of the rack is 130lb which isn’t too bad and should help with stability, high-end racks weigh around 200lb, cheap budget racks around the 80 – 100lb mark, so you’re looking at middleweight mark with this one, as always with the lighter racks we recommend bolting them to the floor if you can, especially if you like to train outside of the rack. Hole spacing is measured in the distance from the centre of the two adjacent holes on the uprights, this distance will affect your reach level of comfort when setting up and performing exercises. 2″ is great, 1-5″ is gold standard, but at this price you’re not going to see Westside hole spacing, although on the positive side at least the hole spacing isn’t around the 4 or 5″, which makes a rack almost unusable for bench presses. The PR1100 has a multi-grip bar perfect for natural, close or wide grip pull ups, with the standard size pull up bar at the front and a thicker bar at the back, the oversized thicker bar will help increase the stress on the forearms, helping you add some mass to a difficult area. It really helps if the upright post holes come prenumbered so you can quickly adjust the safety rods and write that type of info in your training log. 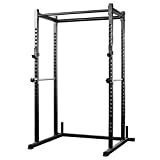 I’ve reviewed many budget racks lately and this is the first rack in this price range with numbered posts, well-done Rep! At 84″ its 6″ short of being a full height rack which you see at the local gym, point to remember here if you are going to be using the pull up bar remember you will need a 12″ clearance above the height of the pull up, you’re going to need 8 foot ceilings to use the Rep rack comfortably. Known by many as the squats for the upper body no rack should go without a set of dip bars, this is one of the big advantages to having a rack at home, you can add very useful attachments such as the dip bars. For ultimate comfort, dip handles should be spaced approximately 22 ” apart, which is not a problem with Reps adjustable dip bars, you adjust the bars by simply sliding them on and tightening at the desired width. Do we need a pulley system? Yes, you do if you want to add constant resistance exercises to your workouts. Constant resistant exercises are something you cannot perform with free weights. Pulleys are great for exercises such as tri-cep push-downs, side-lateral raises, and seated rows. So having a cable pulley system in your home gym opens up additional portions of the exercise world to your training and provides a different type of resistance. The Rep Fitness Lat attachment fits to the back of the rack, remember this will take up additional space, it’s the slower plate version pulley so it’s not best suited for drop sets but will still be a very valuable workstation to enhance your workouts. A cheap space-saving attachment I’d recommend purchasing, it both keeps the weights out of the way, off the gym floor and easily accessible to the bar on the rack. They mount to the rack just like their j cups so can be easily taken on and off, they are sold in pairs with a length of 9 “. REP PR-1100 60 Second Overview! Considering both racks are quite similar rather than go through a whole review of the PR1000, it will be more beneficial to you if I write a quick summary and comparison. For an extra 30 odd $’s you get the 2″ hole spacing, this is fantastic to see on a rack at this price, as we mentioned earlier spacing is very important for reach and range of motion, so typically we want to see more holes that are closer together..big thumbs up here! Base weight storage bars are included with the PR1000, chuck a couple of plates on each one, same weight each side and this will help stabilize the rack especially for dips. I don’t know if we can call this a con but the second pull up bar on the PR1000 is at the back of the rack, if you have the lat pull attached there’ll be no rear pull up bar. The PR1000 also has the 14 gauge 2″ x 2″ frame and same height give or take an inch. To sum up, both the PR1000 and PR1100 racks are excellent for the price bracket, to choose one over the other is tough, I love the multi-grip pull up bar of the 1100 and it has the important 1000lb weight capacity, but for many of you including myself, the 2″ hole spacing of the PR1000 is more appealing than the weight capacity of the PR1100. 700lb capacity is enough for my training but maybe not for you? If you can see yourself lifting over 700lb in the future which not many will, then the PR1100 would have to be your choice, but if like me and you prefer closer hole spacing for pressing and the deep 26″ between pillars for arc movement and extensions, then the PR1000 just takes it. 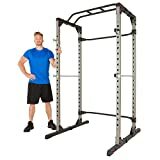 Whichever one you choose you will not be disappointed, 2 of best low priced racks out there, they easily rival the likes of the Fitness Reality 810XLT and BodySolids Powerline 200 rack.